Hello! Today I'm back with another Beauty Big Bang review. If you missed my last review and my introduction to the nail art brand, you can find that post here. 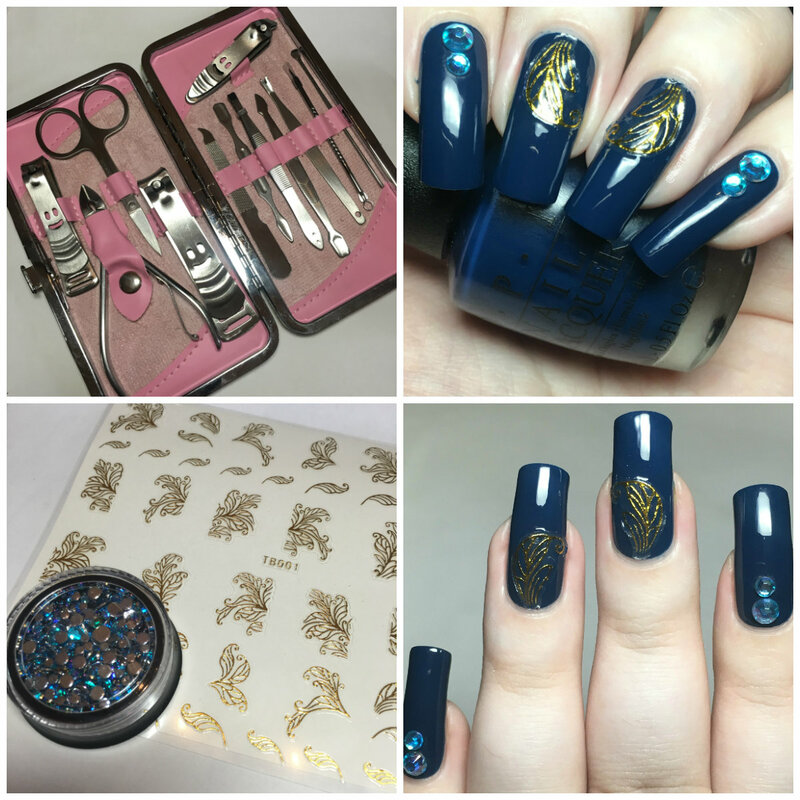 Beauty Big Bang were kind enough to send me some more items to share with you - this time including a manicure kit, a sheet of nail stickers, and a pot of coloured rhinestones. Read on to find out more! First up is the manicure and nail clipper/cutting kit (online here, SKU:50141). I've needed my own for a while - I shamefully stole my boyfriends and have been using it for well over a year. Not only is it finally nice to have my own, but it is gorgeous! I just love the pink floral pattern. Inside the case are twelve different nail care items. All twelve are made from stainless steel, and seem to be good quality tools. I've used them a few times and can't say I've had any issues! My most used items tend to be the curved nail scissors (which I use mainly for cutting decals), and the tweezers. 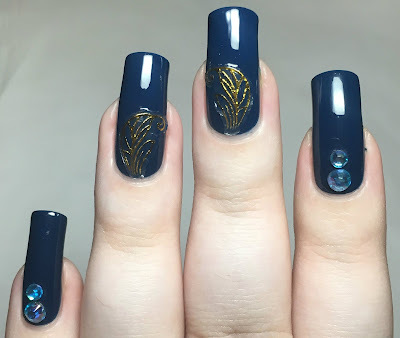 Next I recieved a sheet of 3D gold foil floral stickers (online here, SKU:J1416-2A-GD), and a pot of mixed size light blue rhinestone crystals (online here, SKU:J2423-LBU). The stickers are also available in silver, and the rhinestones in several different colours. I thought the two items would pair together nicely. 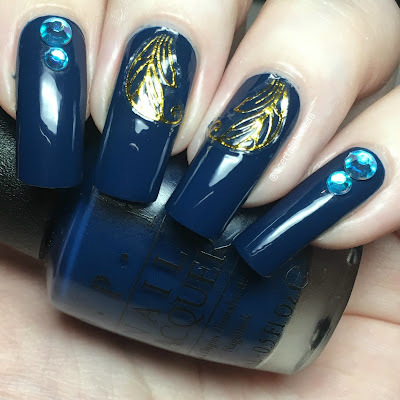 I started with a dark blue base (OPI 'I Saw...U Saw...We Saw...Warsaw'), and added two of the gold stickers to my middle and ring nails. I then added two rhinestones to both my index and pinky nails. I finished with topcoat. What do you think? I did intially attempt to use two of the larger foil stickers, but I struggled to get them to lay completely flat on my nails. I think those with longer nails or curved nails could have the same issues - saying that it may have just been me as the smaller ones were fine! I also had no problem at all getting the rhinestones to sit nicely. You can find all items mentioned, as well as hundreds of others, on the Beauty Big Bang website here. You can use my code 'BECCA10' for 10% off your order.